Waitrose, an up-market chain of British supermarkets, plans to expand its operations in promising UAE market by opening more branches in the emirate this year, its top official said. The food shop of the John Lewis Partnership is to extend its presence in the country with the opening of another supermarket in Dubai, bringing the total number of shops in the UAE to five. It will be opening two more supermarkets in Abu Dhabi later this year. “Dubai is a very promising market in the region and we expect strong growth for Waitrose brand in days to come,” David C. Morton, director B2B Development, told Khaleej Times. Ali Albwardy, owner of Al Thanya Shopping Centre, and Morton jointly cut the ribbon to officially inaugurate the Waitrose’s third supermarket in Dubai. The anchor tenant at the new Al Thanya Shopping Centre, UK’s premier food shop will occupy 26,000 square feet. It will open under licence through the retailer’s unique partnership with Fine Fare Food Market LLC (FFFM). 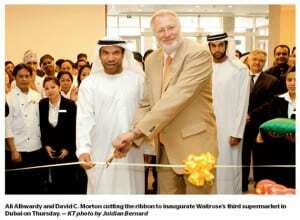 Waitrose is continuing to grow its international presence with five branches in the UAE and the Kingdom of Bahrain. It opened first shop outside the UK in Dubai five years back in 2008. Three years later, it made foray into Bahrain where it has six branches today. Fine Fare Food Market LLC (FFFM) manages the shops, with the support of Waitrose—the shops have created close to five hundred jobs in the region. The shops sell a wide range of Waitrose goods, and fresh produce sourced both locally and through the retailer’s UK supply chain.Located conveniently between Sheikh Zayad Road and Al Wasl Road in Umm Sequim 3, the new shop will be the first Waitrose in the Middle East to offer customers an extended range of Waitrose homeware, which include a wide choice of cooking and dining, bed and bath linen and home fragrance items. In reply to a question, Morton said Waitrose Limited evolves an aggressive expansion plans to strengthened its presence across the UK. Waitrose own-label foods are exported to 45 countries including Kuwait, Qatar, Saudi Arabia, India, Tortola, Trinidad, Barbados, Bermuda, Cyprus, Falkland Islands, Grenada and St Lucia. The British premier brand combines the convenience of a supermarket with the expertise and service of a specialist shop and is dedicated to offering quality food that has been responsibly sourced, combined with high standards of customer service.